Megazone has various packages available for groups of all types and sizes. Options range from a "LockDown" where you have the entire venue to yourself to smaller packages for special occasions. Your Megazone manager will be able to put the best deal together for you based on your needs. Call (09) 573-5333 or make an enquiry using the form below. Please note - this is an enquiry form only, not an actual booking. After filling out this form we will be in contact with you to arrange your booking..
* No booking is confirmed until we have received a deposit towards the booking. 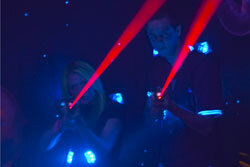 All participants must be 7 years old and a minimum of 1.2m tall to play Laser Tag. All participants must be wearing enclosed footwear no jandals, sandals high heels or barefeet will be permitted in the Laser Tag Arena.